Welcome to the latest edition of road.cc’s buyer's guide to gravel and adventure bikes in which you’ll find everything you need to know to find the right gravel/adventure bike for you, plus our pick of 21 of the best gravel and adventure bikes. In this updated version of our guide to gravel and adventure bikes, we've added the Lauf True Grit and Nukeproof Digger Pro. Descended from touring bikes, endurance bikes and cyclo-cross bikes, gravel/adventure bikes are go-almost-anywhere machines for riders who want to explore and race on dirt roads, and ride Tarmac to get there. Gravel/adventure bikes have gone very quickly from the latest craze to a significant part of most bike companies' ranges. These bikes are tailored for long-distance comfort, with disc brakes, big tyre clearance and geometry honed to excel both on the road and off, whether it's a gravel, forest or dirt track. Lauf's True Grit shuns the usual versatility of most gravel bikes for a pin-sharp focus on racing, with their unique leaf-sprung fork taking centre stage on a bike that's quite unlike most others out there. As a complete package for going very quickly on dirt roads, it's hard to beat. Rhe Nukeproof Digger Pro's chunky WTB Sendero tyres, dropper post, wide handlebar and short stem ensure it really shines on the dirt with great handling poise that’ll have you ripping, popping and sending in no time. Nukeproof is a mountain bike company and has brought this experience into its all-new second-generation Digger Pro, with a lot of influence from the mountain bike world evident in its design and specification. In taking a plethora of tyre widths, the new Secan – the latest model from young British company Fairlight Cycles – can be pressed into action as a rugged off-road bikepacking bike or shod with wide slicks, mudguards and racks for the daily commute or multi-day tour. The Secan may not be the lightest option – steel never will be – but it doesn't lack the performance that makes it a really fun and exciting bike to ride. The ride quality and the smoothness on rough terrain more than compensate as well. I'm a sucker for a good steel road bike, which is why I've always owned one, and the Secan offers that unmistakable balance of comfort, unflappable smoothness and assured handling you expect from a very well designed steel frame. Whyte's Glencoe combines an aluminium frame with 650B tyres and a very different approach to geometry to provide a supremely relaxed, comfortable and confidence-inspiring ride that excels on rough roads and fast descents. Swing a leg over the Glencoe and the first thing you notice is the massively wide handlebar. Within a few miles, and especially after a couple of descents, it becomes very natural and comfortable. I was bombing down all my favourite descents with more speed and less nervousness than any endurance or gravel bike I've tested recently. The wide bar gives you plenty of control through the bends and despite what you might think about the short stem, there is absolutely no twitchiness to the steering, it's all very calm and relaxed. The Silex is a completely new platform for Merida, driven by some intriguing ideas. Taking a cue from current mountain bike thinking, Silexes (Silices?) are long out front compared to almost all other gravel bikes and at 71° have a shallower head angle. The idea is to make the bike more stable over rough surfaces, and our first impression from the Silex 9000 (above) that we currently have on test is that it works very well indeed. South Coast-based Reilly Cycleworks has produced the Gradient as a do-everything adventure and gravel bike, with a lovingly finished titanium frame and smart specification in this £2,799 complete bike. It provides a ride that is as lovely as the bike is to look at, with space for wide tyres for heading off into the wilderness or adding dirt and gravel roads to your route, and a high level of refinement. Cross, Gravel, Road, that's what the CGR initials stand for on Ribble's all-rounder. A disc brake-equipped, mudguard-shod 'do a bit of everything' machine that makes a lot of sense for the rider who doesn't always want to stick to the tarmac. Thankfully, this jack of all trades is no master of none. With a long wheelbase, mounts for mudguards and racks plus being designed for disc brakes, the Ribble is likely to see a lot of use in the wet and cold of winter where the road surface is often less than ideal. It's a bike that's dependable and trustworthy when it comes to the handling. Giant bills its new-for-2018 ToughRoad SLR GX range as "the perfect machine for tackling imperfect roads". With an aluminium frame that can accommodate up to 50mm tyres (and actually comes with tyres that size) it can certainly take bigger tyres than most. That's a big difference from the Contend and Defy bikes that only take up to 28mm tyres, so it don't fall into the gravel and adventure bike category . The ToughRoad SLR GX has a carbon fibre fork with disc brakes, a wide ergo-shaped handlebar and full-length cable housing to keep crud out. There’s even an integrated down tube mudguard to keep splatter out of your face. British brand Genesis was doing adventure road bikes long before it became the latest trend, and the most recent changes to the Croix de Fer - a lower bottom bracket and taller head tube - took it further away from its cyclo-cross roots and closer to an adventure bike. And is there any adventure bigger than riding around the world? That's something that Vin Cox did in 2010, setting a new record in the process, aboard a Croix de Fer. Steel frames feature across the range with a choice of steel or carbon forks, plus disc brakes, external cable routing and eyelets for racks and mudguards. Introduced in 2015, the Specialized Diverge is a series of adventure and gravel bikes with space for up to 35mm tyres. Production bikes are specced with 25mm and 28mm tyres, though, as Specialized apparently — and probably rightly — believes they'll get most of their use on the road. Carbon or aluminium framed, depending on price, the top-end models have thru-axle dropouts for extra stiffness, but all models get mudguard and rack mounts so they’ll double up as a touring or commuting bikes. We really liked the Raleigh Mustang Elite when we tested it. It does everything a regular road bike does, but it does it with the added comfort of the big tyres. 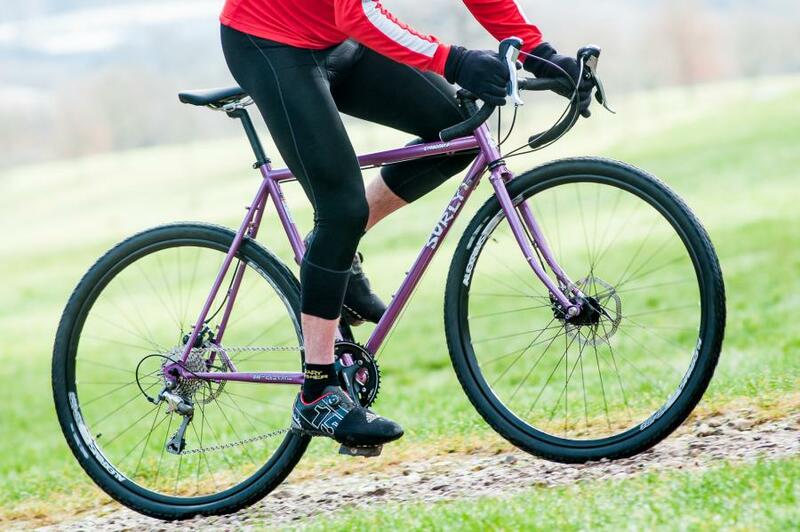 It's part of Raleigh's three-bike range of gravel/adventure bikes and a great example of the booming category. Its 6061 double butted aluminium frame is designed for both on and off road riding so if you're getting tempted by your local dirt roads and trails, or a canal towpath commute, it'll take it in its stride. Along with a carbon fork with through-axle and TRP Spyre disc brakes, the 2018 version, above has SRAM's Apex 1X transmission with a single 40-tooth chainring and wide-range 11-42 11-speed cassette. It's the ultimate Keep It Simple, Stupid derailleur gear system and just the thing for a do-it-all bike. The GT Grade is available with an aluminium or carbon frame (which features a frame design and carbon layup designed to provide comfort in the rough) with disc brakes and space for up to 35mm tyres. You could fit a slick tyre in there or a treaded cyclo-cross tyre if you want to inject more dirt and gravel into your riding. The Grade has versatility too, with mudguard and rack mounts neatly incorporated into the frame and fork. The top models have a carbon thru-axle fork for added stiffness. We like the 105-equipped model for its combination of Shimano's excellent gears with TRP's cable-actuated hydraulic brakes. If you're looking at the Cycle to Work Scheme sub-£1,000 level, check out its Tiagra-equipped stablemate. ATR stands for Adventure-Tour-Race and it's a bike built for adventure riding, cyclo-cross, touring and sportives. Kinesis build the frame from custom drawn 3AL/2.5V titanium tubing, with geometry featuring a low bottom bracket, long head tube and relaxed head angle, something that all these adventure bikes have in common. There’s space between the rear stays and carbon fork for up to 40mm tyres (but we’ve comfortably fitted wider) along with full-length 45mm mudguards, and there are rack mounts too. Canadian firm Norco is best known for its mountain bikes, and its Search bikes have been designed as adventure bikes able to tackle a multitude of paved or unpaved surfaces. Combining a steel or carbon frame and ‘endurance’ geometry with disc brakes and thru-axles at both wheels, it’s a bike ticking a lot of boxes. Comfort has been factored in with a 27.2mm seatpost and bowed seatstays, arcing chainstays and a tapered seat tube, and the carbon fibre models come with 650B wheels. The 2019 range kicks off at £1,350 with the Search XR STL Apex and peaks with the £3,350 Search XR C Force above. The British made Shand Stoater offers a steel frame and fork that has been designed for “the pure enjoyment of go-anywhere riding… refined enough to be your main road bike but rugged enough for off road trails and singletrack, it could be the only bike you ever need,” according to the company. It’s available in several builds, we tested one with a Rohloff hub and Gates Belt drive costing £3,595, but other builds are available. Tyre clearance is good enough for 45mm tyres and the frame is decked out with rack and mudguard eyelets and three sets of bottle cage mounts. The Mason Bokeh is a highly capable adventure bike with a feature-packed aluminium frame, splendid aesthetics, and handling that ensures it's as at home on the road as it is on the trail. The Bokeh combines an aluminium frame and carbon fork with all the key ingredients of an adventure bike, including wide tyres, disc brakes, thru-axles, relaxed geometry and mounts for mudguards and racks. The Bokeh goes the extra mile with a front dynamo mount, third bottle cage mount, 700C and 650B wheel size compatibility and fully internal cable routing. As lovely as the Bokeh undoubtedly looks, its appearance is pointless if it's not backed by a high-quality ride. Fortunately, a high-quality ride the Bokeh most certainly does deliver. In a nutshell, it's a lovely bike to ride, whether on tarmac or gravel roads, or woodland byways. The Genesis Datum joins a class occupied by the brilliant Cannondale Synapse and Giant Defy, but while both those bikes limit tyre size to 28mm the Datum accommodates 38mm tyres and has mounts for full-length mudguards. Add a beautifully finished carbon fibre frame and fork, a slick shifting Shimano Ultegra drivetrain with hydraulic disc brakes, Clement Strada tyres, and you have a hugely capable bike that is loads of fun over all sorts of terrain. This is a bike that has a very sure-footed approach, whether cruising along a smooth road or exploring gravel paths and singletrack. If you don’t race and you like a slightly taller front end, you’ll be right at home on the Datum. Long rides are dispatched with ease. We were impressed with how comfortable it was during a 190km ride during which the Datum revealed a quick turn of pace with lively handling that makes it a fun bike to ride. I'm interested in this kind of bikes. Do you know what the maximum tyre size the Croix de Fer will take? Any reason why the Cotic Escapade didn't appear on the list? Also has anyone tried using 27.5 in wheels with narrow MTB tyres to make some kind of rigid 80's style MTB for the lower end of the technical riding scale? 'gravel bike'. Godawful marketing shite. It's this generation's 'All Mountain'. Im really interested in getting a gravel bike for my new winter bike. Does anyone have any recomendations for an Alu framed bike that has mudguard mounts, disc brakes with thru axles that can be used mostly on road but with some easy offroad? If you can live with out thru axels the Merlin Axe7 Pro (https://tinyurl.com/mbsz6wq) may fit you. Can fit upto 35c tyre with guards. I had this thought last winter, but instead of buying a trendy gravel bike aka more expensive (from what I found) I went with a Cannondale Badboy secondhand off ebay. It is more hybrid frame than road-orienteered with flat bars, but it has hydraulic discs, 35mm tyres and full mud guards. Does my winter commute superbly on the road, and manages cutting through the woods or along tow path without issue. Alotonic - "gnar-road" - Definitely deserving to going in the Dictionary. I shall be attempting slip it in to as many conversations as possible. Sonder Camino looks pretty good to. Merlin have a CX bike 105 equipped which is quite competitive too th a similar range of gear IIRC. Can't quite recall the clearance. No mention of the Cube cross race pro.......! A staff member at Evans says here that the 2017 CdF will take up to 40mm tyres (see the Ask A Question section). My 'Gravel' setup is a 2013 Specialized Secteur Sport Disc running a 2.1 Thunder Burt up front and a 33mm Tracer at the back, both tubeless with Orange Seal on Mavic Allroad Pros gearing is 50/34x11-34. It got me round Moors & Shores last weekend (30% road, 30% gravel, 30% farm/fire road, 10% single track) and should cope well with the Dirty Reiver later this month. Planet X/On-one do an alloy frame and carbon fork adventure bike for about £299 I think as well as some more spendy carbon machines. My only criticism of my hybrid - Whyte Portobello - is that it doesn't have the chainstay clearance to put CX tyres on it. Yes, I know it's one of their "fast urban" series, but there seems to be plenty of clearance on the forks and seatstays and the ability to put something knobblier on would be fantastic for family rides to/round the local park and varying my commute with some tow path action. I do wonder whether a hard-tail 29er would have been a better choice, but the Whyte was a bargain at the time and does most of what I want it to do very well. Just checked. Full Monty £349 frame and fork. £549.00 Bish Bash Bosh full carbon f&f, Space Chicken full carbon 650b+ full carbon f&f £699.00. I am not an employee of the company. I have had a PX superlight carbon road machine for 10 years. Done a fair few thousand miles under my Clydesdale body mass with no complaints. Replaces saddle 2 years ago, seat post last year. Rest has been drivetrain wear items. For the money I have no complaints. If I can't raise the cash for a Bokeh I will certainly be looking at these On-one machines. I keep thinking the same, as these CX inspired Graventure bikes become more off-road capable, at what point should we start slapping drop bars on XC bikes? Will it even be worth keeping RS-1s instead of solid carbon forks? While I am sure the Mason Bokeh is a better bike, I personally went for the (cheaper) On One Bish Bash Bosh as I wasn't sure how much I'd be using a gravel/adventure/monstercx bike. Was lucky to get the frameset at £370 during a sale. Strange that GT Grades get more and more expensive. I have the 105 2015 model that I got for 900 EUR last year. Changed wheels and ride 50/50 road and single trials. Fantastic bike! For a low budget but fun gravel bike (without thruaxls) I can recommend the Mango Point AR, I use it as a winter bike with 32c slicks and a summer gravel bike with 40c knobly tyres. So much fun to ride! These bikes are very limited in some respects, quite a few don't have much clearance for a really wide tyre (despite the continual statements that discs afford wider tyres to be fitted), some have barely any clearance for reasonably wide tyres plus mudguards or indeed have no proper guard mounts or eyelets for a pannier rack either. None are a match for the specialized Tricross in the high end models for flexibility, comfort and the ability to have 55mm wide tyres, even wider at the rear. I can fit 60mm wide tyres on a 29 rim to my globe expert drop conversion which is a rock solid but fairly lightweight audax/tourer/winter racer/utility machine with a set of guard/pannier mounts plus low rider mounts, carbon forks/stays/seatpost plus a sturdy alu triangle. To pique my interest you'd have to match all the functionality, keep the ruggedness and comfort as well as to a reasonable pricepoint and frankly none of the above come close to matching framesets such as the Globe or Tricross that are 10 years old now. Yeah, but you're kinda crossing into expedition tourer territory there. These are all day (or several day) bikes and 60mm tyres are not generally chosen by many people for the road - not knocking you for liking them! If I wanted a bike like that I would be looking at a Salsa La Vaya or something more 'boss'. I know you're going to tell me that a 60c tyre is great for x and y, but most people are simply not going to put something that heavy on a road bike that is not for touring. I have two of the above bikes and find anything over 32c a bit of drag, though I would certainly go out to 42c for a off roady tour on the Tripster. 28c seems a good balance between weight, comfort and reliablity on Uk roads. So writing these bikes off because they won't take 60s seems a little, er, edge-casey. Why no Reilly Gradient.? It got a great review here only a couple of weeks ago. With mudgaurd mounts and rack mounts? I'll stick with my adventure bike thanks. I've been happy with a £450 Revolution Cross. Done the C2C a few times, hundreds of miles commuting on bridleways and wagonways, road days, lanes, gravel paths, stony paths, forest tracks, beaches and Northumberland hills. Sometimes with racks and guards, sometimes with niether. Sometimes with 35mm unpuncherable Conti Tourers, other times with 28mm tyres. Deals with anything. This latest craze seems just another fad and excuse to flog more £1,000 bikes. But a road bike that is lightweight, reasonably agile AND flexible in terms of its use/fittings is far more advantageous than those that aren't. There is nothing in the list here that is any better than the frames I mentioned, currently my Globe is set up for Audax/light touring duties but it could be used for expedition, it'll take 140kg all up without batting an eyelid plus it has a 24 tooth inner ring that with a 36T sprocket can get you up/along pretty much anything (and with a normal long cage rear d). I could use it for commuting, I can and have used it during winter and warmer months for general road riding (albeit at my meagre 16-17mph av. ), it can be used as an offroad 'adventure' bike as the ones listed are pitched at and with all those types of cycling have the ability to fit a huge range of tyres widths on anything from a 27.5 to the current 700C and 29er type rims AND be able to have a proper pannier rack fitted and normal full length mudguards whilst still having clearance for 45mm+ tyres with them fitted. none of the bikes here can do all that can they accept the Jamis Renegade which can 'only' accomodate 40mm tyres without guards and is best part of £3k. Why wouldn't you want the best all-rounder you can have (especially valid to those that can have only one bike) why compromise to spending upward of £2,000 and still be woefully short in terms of flexibility compared to that of frames that do everything these do and more but were designed 10 years ago? my point is, it's all well and good pitching these bikes but losing the practicalities so that you can have a bike for all occasions means compromise. Make a bike the equal or better than what has already being made previously and I'd be interested. none of these interest me because of the reasons I've stated. I've just come back to cycling after quite a long break and after doing my research I chose a Trek 920 for my new bike. I've been very pleased with it, despite a couple of minor niggles. It meets your stated criteria and comes already fitted with its own sturdy front and rear racks. Bottle cage mounts are strangely placed - yes you can fit four cages on frames sized 56cm and above, but in practice their positions affect the size of bottle you can use. Some complain about the standard saddle but it suits my body shape comfortably although I do wear padded cycling shorts. The reach of the standard stem was too long for me so I opted for a shorter one. Other than that, it's been great for my fully loaded touring needs as well as longer day trips. "super-versatile bikes that are at home on lanes, potholed streets and dirt roads"
Which given the way the surfaces are deteriorating will soon be everywhere other than the M23. Sadly Jamis / Evans seemed to have stopped selling the Renegade Expert - the cheaper of the carbon bikes in the range. I've got one from a year or so back, still with hydro discs, thru axles, tubeless rims, mudguard mounts etc. Bloody brilliant as a commuter/winter bike.. and half the price of the Elite model. Very strange. 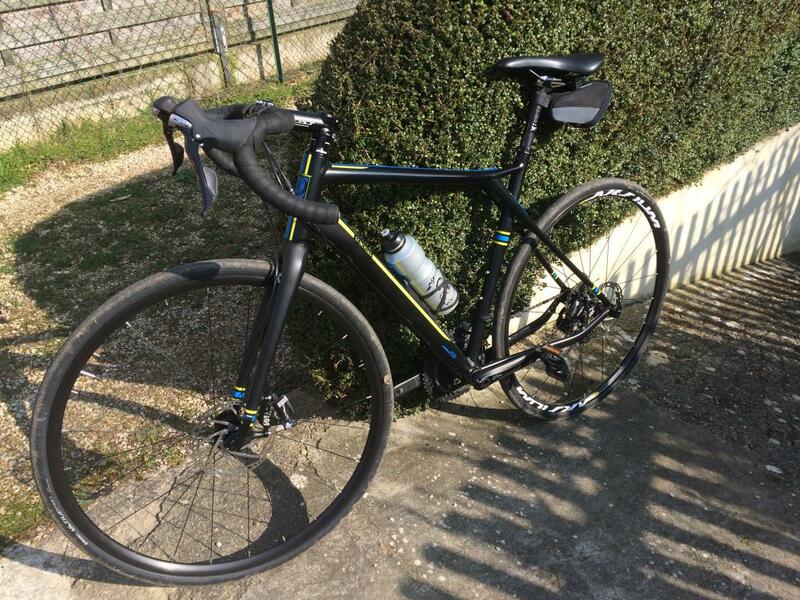 Fully agree with you - i bought a 2016 renegade expert for £1300 from evans, upgraded the wheelset to hunt four seasons and have a bike that's fantastic for endurance riding, a bit of cross and light touring.